What kind of family relationships do you want? I am now a mother and a grandmother. When I had three little children sometimes I would become angry at them for no apparent reason. I became worried about this because I wanted to have a loving relationship with them. It seemed that this emotion came from no where and I couldn't understand it. If I had only known about the 'implicit memory'. It seems that this memory we have from birth remembers emotions, behaviour, perception and other bodily sensations. We are not aware of these memories that come from the experiences we have right through our lives. So my experience is totally understandable now. When I became angry 'out of the blue' all those years ago it may have come from a prior experience in which anger was involved. Then when I was with my children it was triggered somehow and the emotion of anger appeared. This must happen to us all the time. Do you ever feel some emotion or bodily sensation you can't explain and it is so strong that it becomes disconcerting? It became so worrisome for me at the time that I followed it through with personal therapy work. I am so pleased that I did because I came to understand it and learnt to control it. I decided I didn't want anger outbursts to effect any of my relationships. 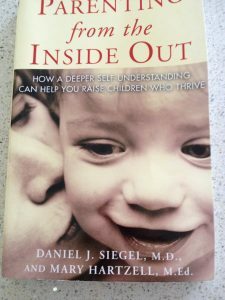 This new found knowledge of the 'implicit memory' has come from a wonderful book 'Parenting from the inside out' by Daniel J Siegel and Mary Hartzell. This information is only part of a book that helps us understand how we can make strong connections with the ones we love. I wish that I had read it when I was in the midst of parenting my four children. Never mind now I am able to use this important knowledge in my 'grandmothering'. Nothing is ever lost.